The long trip to Vigan thru La Union tired all of us but we all woke up early to grab some breakfast and head on another long drive (but shorter than the day before) to Laoag and Pagudpud for some sight seeing and picture-taking. Our first stop was at the famous Bangui Windmills. Bangui Windmills on a cloudy day. As we came nearer the area, it was slightly raining and there was a fog which made us really thankful to be in our jackets and shawls. Thus, most of our pictures look dark and even our photographer friends said that if there was more sunlight, the windmills would be an even more beautiful sight to behold. The way to the site was a narrow, paved road which seemed to take us into the hills instead of towards the shore where the windmills would be. We first thought that we were getting lost but since the road was too narrow to make a turn with the van, we decided to plod on. 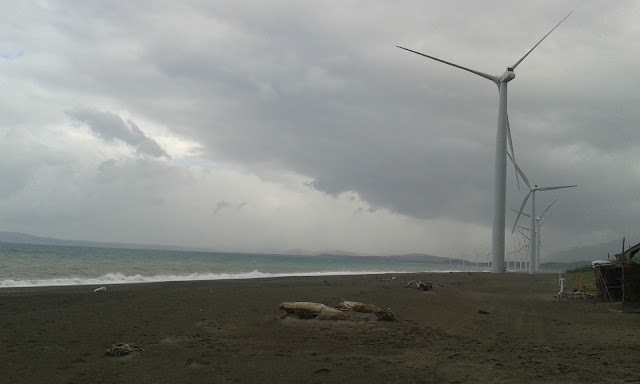 Our patience was rewarded when we finally saw the welcome sign, the shore and the windmills. A souvenir shop right at the entrance of the site. Still looks impressive even in the foggy weather. The actual shore was down a slope from the hill where the entrance was. The hill offered an expansive view of the shoreline and the windmills and also served as parking lot. It also has a carinderia for hungry visitors, a paid comfort room, and a souvenir shop where you can buy shirts and other knick knacks. Here are some more shots of the windmills and its surroundings. View of the windmills from the wide hill. A grassy spot by the parking lot gave us this picture. The windmills near the shore surrounded by fog. We weren't able to take a group picture or selfies because the wind was so strong and cold and there was a continuous drizzle which didn't drench us but did made taking pictures on our cameras and mobile phones quite challenging. Souvenirs of the windmills that you can buy from the many vendors at the site. After taking in the view and buying some souvenirs, we piled into the van again for our next destination.